The nightmares appeared throughout the whole block of Odyssey and they usually had either an etb downside that was withdrawn when they left the battlefield or an etb upside that likewise vanished when the creature went away. Laquatus's Champion is maybe the most prominent example of the bunch. The wormfang Devourer makes all the nightmares twice as powerful or, in the case of the other wormfang creatures, at least playable. Reaching threshold is made easier by the Devourer's own ability to have you discard. PS: Can anybody please pn me and tell me how I can have those big card images in my posts? Thanks. Do you wonder whether your set's mechanics really pull their weight? Have to link it as an image from the external site. If you upload the image, my assumption is that the forum keeps it with a maximum size limit, shrinking the card if it's too big. gluestick248 I think this might be ripe for judging. All right, it’s Judgment time. This was a bit of an Odyssey, but eventually I got here. I sincerely apologize for the puns, and to prove it, I’m not going to make a Torment pun. I really like the 3/2 for 3 mana dork, and I’m surprised we haven’t had one yet (the closest is Skyshroud Troopers). The Threshold ability is also very nice, and helps fix your mana too. You and the Torment design team both recognized that White needed a way to exile graveyards. However, Morningtide leads to more interesting decisions, since you’re turning off your own Threshold as well. Don’t get me wrong, Consecrate would fit perfectly in Innistrad, but I think R&D wins this one. You’re a little early for tribal, but it’s definitely an interesting card in older formats where you can play more Centaurs and Druids. However, the change from to less seems very low-impact. I really like the to sacrifice it (with a few tweaks because an opponent can’t sacrifice your stuff), but the Snapcaster ability isn’t in White’s color pie. Maybe in Red, with the ability just targeting one card, would work better. Solid uncommon. Not overly exciting, but an excellent support card. I wouldn’t be surprised at all to see this in a Torment pack. I was surprised to find out that the blue and red Nightmares only showed up in Judgment. However, that Torpor Orb/Panharmonicon ability is really sweet. I wasn't entirely sure I'd when that with what was essentially the angry cousin of Krossan Restorer. Fortunately, I did have an idea...I'm just not sure if I'm allowed to pick this. A few years ago, there was a certain set that Wizards didn't want to reveal the name of, to avoid spoiling where the story was going. So, they announced two different set names. Now, technically, only one of those ever actually got published as a set. 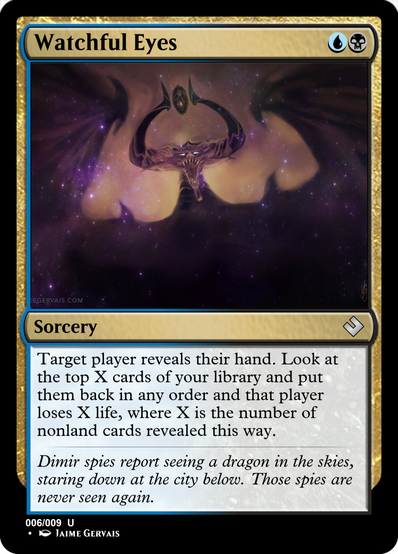 However, there was one promotional card made for the decoy, complete with expansion symbol, which means that technically the other set does exist. Yeah, I'm talking about Mirrodin Pure, a "set" represented entirely and only through the promo copy of Pristine Talisman. 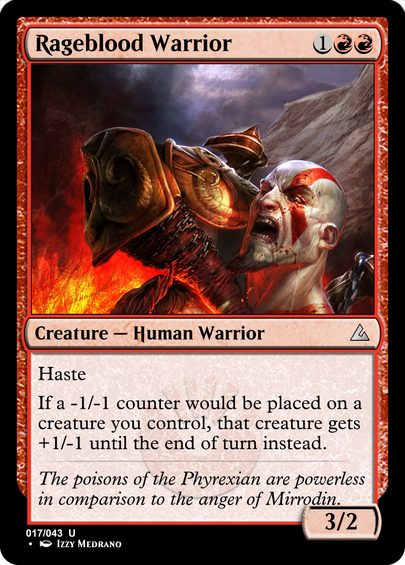 Basically, I guess that's New Phyrexia, but if the Phyrexians had lost and weren't strongly represented in the set. So, hypothetically you wouldn't have seen Phyrexian mana, and maybe less Phyrexian mechanics overall. Instead, there would probably have been some mechanical callbacks to the older Mirrodin block. Is that allowed? Is that too high concept? Lore: The daughter of Jor Kadeen, she has undertaken the task of cleansing Mirrodin of the Phyrexian plague, burning it out anywhere she finds it. : Add . You lose 1 life. I'll go ahead and say that my odd choice of set probably contributed to low turnout. Tesagk Setting up a child to one of the canon resistance members is a great way to tie your submission to the lore. Very Future Sight-esque. It's clever how the double-strike and cost mirror the original. The anti-infect design is a good way to represent Mirrodin being purged of Phyrexian influence. Metalcraft is a good way to reinforce the Mirrodin influence of the card, though I do note that when the Metalcraft effect is active, it can be a downside as well as an upside. viriss This has a really cohesive design. 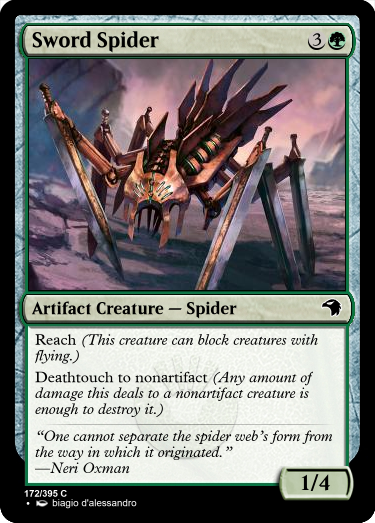 Coloured artifact, very green type and abilities, good choice of art. I see that real-world flavour text, though. 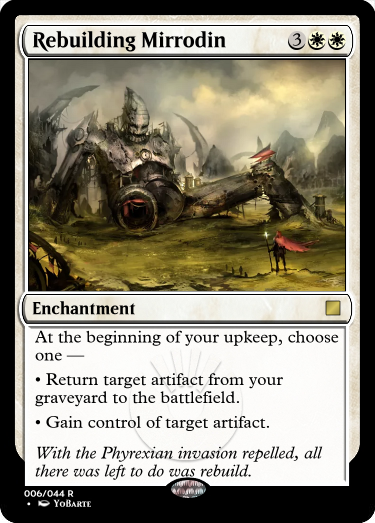 In any case, interesting choice to make the deathtouch only affect non-artifacts. I suppose it fits with Mirrodin artifact love, but it still feels weird to see. Jartis Very flavourful card. Possibly very strong, though. I think that, especially in a block with a lot of artifacts, the option to indefinitely steal an artifact every turn is a definite game changer. Possibly too strong, and I'd say certainly undercosted, even before taking its flexibility and grave retrieval into account. gluestick248 Interesting inversion. I like the flavour text, and the idea of a Phyrexian version of the Pristine Talisman is certainly clever. The lower cost and life loss is a good parallel to the original, though I think that compared to other mana-producing artifacts, it's a bit too high cost for what you get. gateways7 This is an interesting design. Again, we see the infect hate, which I still think is a good mechanic for rebuilding Mirrodin. Overall, a very solid design, and not much I can really say about it. I like that while it prevents the permanent power-down from -1/-1 counters, there's still a negative rather than just turning it into a pure positive. That does a good job of showing the creatures powering through on pure anger, rather than being completely unaffected. In the end, I pick Tesagk as overall winner for this round. Thanks for the win, kefke ! For our next set, we'll go to the ever-loved original Ravnica set. The only requirement is that the card be multi-color. You can do this with or without hybrid mana. 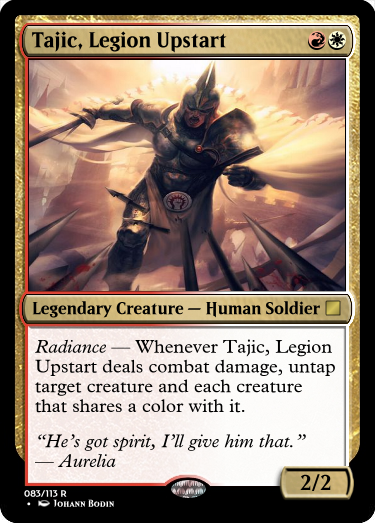 However, I will give bonus points to anyone who can have their lore, while taking place in the chronological setting of the original Ravnica, somehow connects or "predicts" a card or cards from either Guilds or Allegiance. I may have went a little crazy on this one. EDIT: Since other people are explaining their logic, maybe I should explain mine. I decided to be my usual oddball self, and rather than predicting the existence of a card, predict the lack of one. 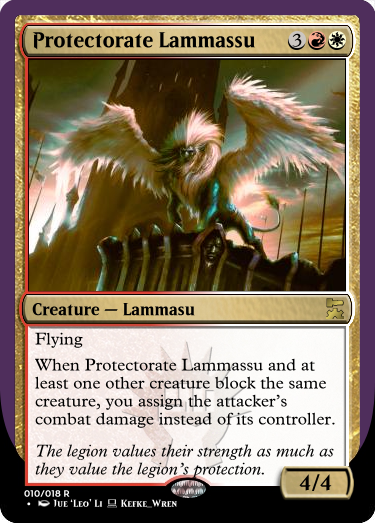 Unless the latest set proves me wrong, Ravnican lammassu have appeared on only one card ever, and then never again, implied to have been hunted to extinction by some unknown Black horror. I liked the idea that some of them would have sought protection, and struck some kind of deal with the the Boros for it. 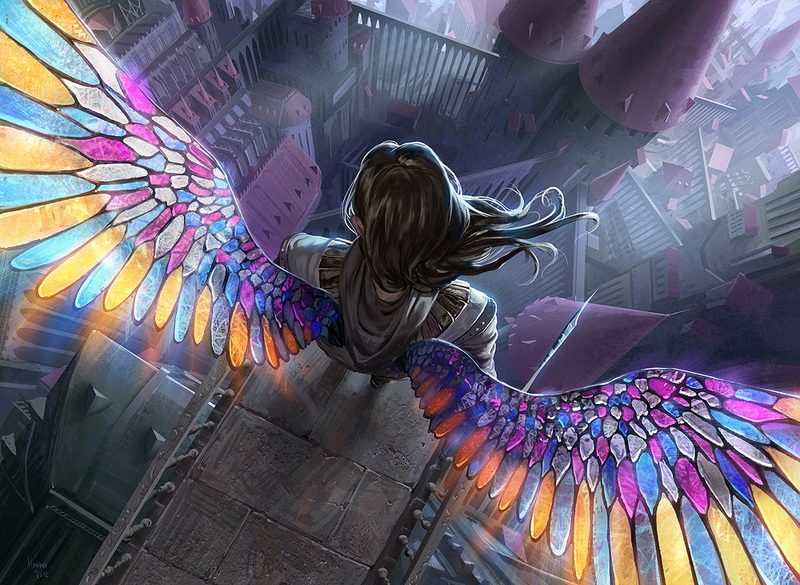 The "prediction" the events of pretty much all of the three new Ravnica blocks, and foreshadows Nicol Bolas's involvement on the plane before he was even introduced as a Planeswalker in Shards. Maybe not a "prediction," but more of a "pastshift." 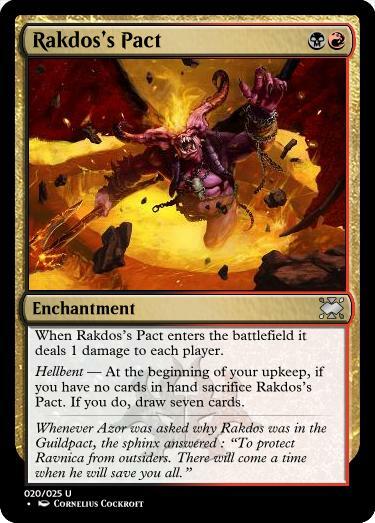 My hopes for War of the Spark are in Rakdos beating Bolas (or at least some gods), so my card depicts his function in the Guildpact, to act as a protector of the plane. And yes, in theory it's possible to just draw two cards with this every turn and even have a bit of control about what you draw but only if you're willing and able to spend five mana every turn. I think it's fine. The only reason this didn't get full marks from me is a slight question of power, combined with the fact that Lammasu are such an unchartered concept that it's difficult to know what niche they get to fill. I feel like this entry is... a bit weird? It's in the color of Bolas, has Dimir colors and Dimir flavor text, but I had trouble matching up the flavor to the card, which kept me from giving it full marks. Still a very neat card, however, solid entry. I really liked this. It didn't get full marks because it feels a little weak to me, but it's honestly a solid 2-drop, so what do I know? I think this card would certainly have fit well in the initial Ravnica set. Then again, it's been forever so I'm not sure what synergy it would or wouldn't have. I really liked the concept of this card, but I have a feeling this card is a little bit on the strong side. While it's not necessarily easy to empty your hand quickly, a deck like Rakdos which is built around it, makes this feel like a guaranteed "7 new cards" by turn 4 or 5. I think it would have made more sense if it let you draw to a smaller amount... say 4 cards. Or draw 7, discard 2 or 3. The card is interesting. I can't precisely nail what's bugging me. The card certainly isn't overpowered, and it definitely helps Golgari, but it just doesn't feel like it all comes together in the right way. At least for me. This card is sort of fascinating to me. I feel like it's probably overpowered, but when I compare it to the Immortal Sun... maybe it isn't. It's hard to judge the power of expensive cards like this. However, I really do enjoy the idea of something supporting the Guild Pact in the original set. Personally, I like when we explore concepts that remain relatively unexplored in a setting. I also think the effect is neat enough, and balanced against cost that I'm giving the win to it. That being said, with how powerful the effect is, I think it might be better as either a 3/4 or 3/5, but I'm nitpicking at that point. Runner up: Jartis . This idea is really cool, and, ultimately, it's difficult to balance a CMC 2 rare drop, so I can't say whether or not this works. But, given that he doesn't have any keywords, I'm willing to side with this being balanced, and a nice little bit of lore as well. Thanks Tesagk - My thought process on costing the effect was that Banding used to be considered fine for 1-drop commons, so a stripped-down version would probably have been okay at roughly the value of Vigilance in rare. I think I'd like to go with one of my favourite sets this time around and visit Coldsnap. And for an extra condition, something I think WotC R&D could have done when replacing Homelands: The card should be something that isn't "on colour" any more, but used to be (such as green faeries). kefke How would you suggest we go about finding out what used to be in color but isn't anymore? Seems like too abstract of a thing to be able to easily search. 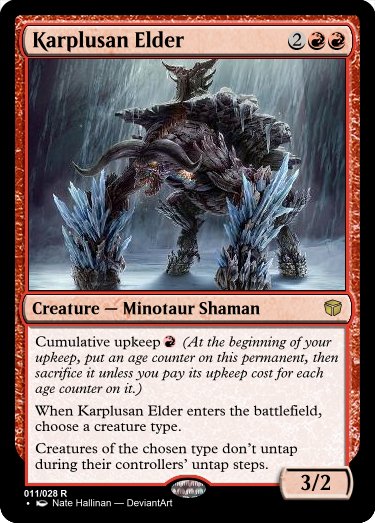 A mix of An-Zerrin Ruins and Karplusan Minotaur. Seemed like a good mix to me. There's a few resources that can help with that. Obviously, you could just pick an old set and skim through cards for inspiration (Ice Age, Alliances, and Homelands would be the obvious ones to look at, being the original block). I'm assuming you want a bit more of a guidepost to work from, though. The first place I would suggest to look is at Mark Rosewater's "The Great Mix-Up" articles from Planar Chaos, actually. They don't directly talk much about things the colours used to do, really, but they offer a lot of insight into the concept of "things a colour could have done, but doesn't", which can help give an idea. For a more direct answer, though, the Small Change and Working Your Core articles might be exactly what you're looking for. Ultimately, it's going to have to be a bit of a gut thing, though. WotC is known to bend and shuffle the pie when it's appropriate for a set, and you kind of have to have a working knowledge of both old and new sets to see where trends have changed over time - which, honestly is a skill that's important for this game anyway, since you never know what set and its associated design philosophies you might get thrown. EDIT: As a caveat, it doesn't have to be something a colour never does any more, just something that isn't normally done any more. For example, White still gets some cards to deal with artifacts, but not as good as they used to be. 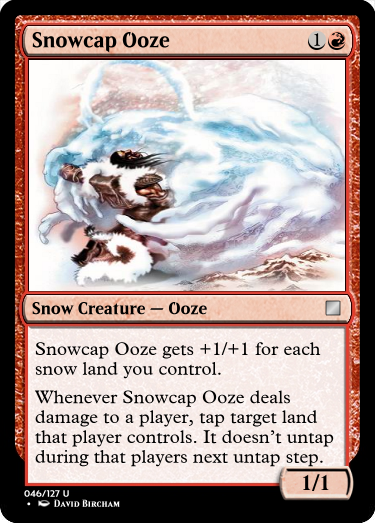 Alright, well, the first ooze was red, and Coldsnap had a red ooze, but we haven't seen red oozes since Conflux, so I'm pretty sure this counts. Even though mechanically the things it does are still primary in red (land counting and freezing lands). Both of those links are broken. Tesagk I'm not having issues with either of them. May be your browser? I'm on Chrome.